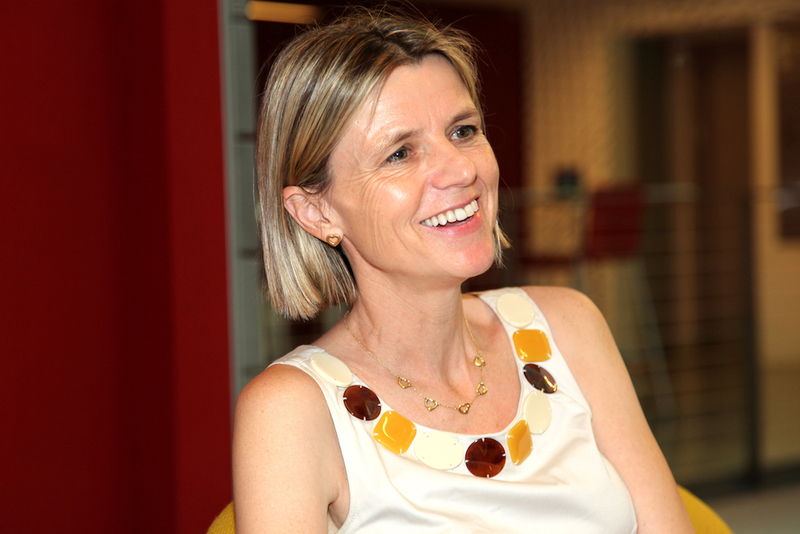 Magali Delmas is an economist at the UCLA Anderson School of Management and the director of the UCLA Center for Corporate Environmental Performance. Her research focuses on strategies promoting conservation behavior and the development of green markets. She is a former president of the Alliance for Corporate Sustainability, and her latest book is The Green Bundle: Pairing the Market with the Planet. Before taking part in a Zócalo/UCLA Anderson event “Does Environmentalism Need to Make Peace with Capitalism?” at The RedZone at Gensler, she spoke in the green room about California’s optimism, her mother’s advice, and Tom Hanks’ movie roles. What are you reading for pleasure? I actually am not reading anything for pleasure, which is unfortunate. But I’m giving something that gives me a lot of pleasure, which is also for work, which is [a] book…about California and the environmental movement, and why California is so exceptional, and what explains the development of regulations and all the movements that make California so great. It’s beautiful. I had almost tears, reading the introduction, because it’s describing the beauty of California. And for me, California is a place I chose—I chose to come here, and I think it’s really beautiful. What attracted you to California? Why did you decide to come here? The optimism. Because I come from a country, France, that has been depressed for many years. And actually when I was growing up, and when I was studying, everybody would say, ‘You can’t do this because there’s no employment there, and you can’t do this and you can’t do that.’ And you feel really constrained, that you can’t do anything, everything’s going to be so difficult. And I came here as a visiting Ph.D. student at Berkeley, and I felt like here everything is possible. And I came back to France and finished my Ph.D., and I thought, ‘I really want to live there [California], I really want to be part of that dream.’ And I did. Was there a teacher or professor who really influenced you? My mother was my schoolteacher, so maybe she’s the one. She was teaching elementary school. I think she encouraged me to be an independent woman. She was encouraging me all the time to do what I wanted to do, which I think was nice. What’s some of the best advice you ever got? Again, it’s got to be about independence: Be independent and get your own money. I feel as a woman, that’s from the first generation of feminists, Simone de Beauvoir. That was kind of a revelation, to say the only way to be independent and to do what you want to do is to earn your own money, to have your own salary. What’s the most beautiful movie you’ve ever seen? I’ll have to think about that. But I can tell you the most recent movie I’ve seen, with Tom Hanks, where he’s a lawyer who helps a spy. [Bridge of Spies] I thought it was actually really quite stunning, because it was about the building of the Berlin Wall, and what I loved was the way they portrayed the way the wall was built, and people had to choose either to stay where their home was, their apartment, or to move into the U.S.-controlled zone, without knowing what the future would be. There was a lot of uncertainty, and those who missed that tiny window of opportunity got stuck there for 40 years. And I think there are these moments in life when you have to make these choices with very little information. And in this movie, that was suddenly made clear to me. Which other city would you most want to live in? I actually really like Los Angeles. It took me a while, but I really do! I like Santa Barbara. I’ll live in Paris next year—I’m taking a sabbatical. We’re leaving in August and I’m taking my three children. Do you speak French to your children? What do you miss most about your native Paris, or France? I think what I miss the most is people laughing, joking around, freely, without like being afraid of being PC. It’s just more like anything goes, it doesn’t matter, it’s just for a laugh. I think people are more relaxed than here. Or maybe it’s just that now I go there on vacation. Maybe it’s just a bias that I’m not working there, and so I just go there for the enjoyment. So what do you do to relax? I’m in a phase in my life when I don’t get much time on my own. But I have had more time, and I used to go flying—I’m a private pilot. I used to go scuba diving. I like to be in three dimensions, so I really like that. But right now it’s just hard to find the time, because I have children, and one small one.